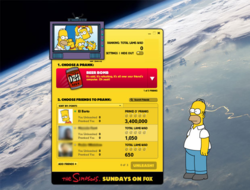 The Simpsons Unleashed was a desktop AIR app for Windows and Macintosh that was released as a part of the Best 20 Years Ever. The app was integrates with Facebook friends that had the app. In the app was an virtual Homer or Bart seeing on the desktop. The user could send them away to their Facebook's friends desktop and do pranks to their screen. Every prank gave the user points and the high score list could the user see how good their friend are. The app could also publish posts on the user's Facebook log. During 2011 they cancelled the app. Modified on January 19, 2014, at 05:36.